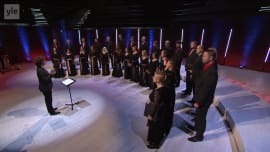 Let the Peoples Sing: Let the Peoples Sing (In English) International EBU Let the Peoples Sing Choral Competition's Final Live from Helsinki Music Centre. Let the Peoples Sing: Let the Peoples Sing (ruotsinkielinen selostus) Direkt från Musikhuset. EBU:s internationella körtävling med långa anor samlar högklassiga körer från olika delar av Europa för att tävla om pokalen Silver Rose Bowl. Let the Peoples Sing Suora lähetys Musiikkitalosta. Perinteikäs EBU:n kansainvälinen kuorokilpailu tuo kovatasoisia kuoroja eri puolilta Eurooppaa tavoittelemaan Silver Rose Bowl -pokaalia. Let the Peoples Sing: Let the Peoples Sing 2017: Gala Let the Peoples Sing Gala Concert at Helsinki Music Centre 14.10.2017 featuring Rajaton Ensemble, competition finalist choirs, previous winner Aarhus Girls Choir and Finnish Silver Rose Bowl winners. Let the Peoples Sing: Let the Peoples Sing 2017 Winner of the Silver Rose Bowl: Collegium Musicale & Endrik Üksvärav (Estonia) Cyrillus Kreek: Mu süda, ärka üles. Encore after winning the Silver Rose Bowl. Helsinki Music Centre 15.10.2017. TV Director Kimmo Kajasto. 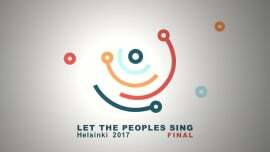 Let the Peoples Sing: Let the Peoples Sing 2017 Final: Prize Giving Ceremony of Children and Youth Category & the Silver Rose Bowl The first prize of children and youth category: Vaskivuori Upper Secondary School Chamber Choir & Jonna Vehmanen (Finland). 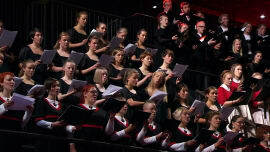 The Silver Rose Bowl: Collegium Musicale & Endrik Üksvärav (Estonia). Let the Peoples Sing: Let the Peoples Sing 2015 Winner of the Silver Rose Bowl: Aarhus Pigekor & Helle Höyer Vedel (Denmark) Susanna Lindmark: Vid Torneträsk (Ann-Margret Almgren). Sören Möller: I am the Rose of Sharon (Song of Songs). Jaakko Mäntyjärvi: Pseudo-Yoik Lite (choreographer Panda van Proosdij). Let the Peoples Sing: Let the Peoples Sing 2017 Final: The Musical Originals Singers & Imogen Nicholls (UK) Chen Yi: Chinese Poems 1. Up the Crane Tower (Wang Zhi-Huan), 5. The Cataract of Mount Lu (Li Po). Peter Maxwell Davies: Seven Songs Home 3. The Heather Track, 4. At the Lochan. Trad. arr. Let the Peoples Sing: Let the Peoples Sing 2017 Final: Estonian Radio Children’s Music Studio Girls’ Choir & Kadri Hunt (Estonia) Michael Praetorius: In Dulci Jubilo. Arr. Cyrillus Kreek – Kadri Hunt: Oh Jeesus, Sinu valu. Ko Matsushita: Ave Regina Coelorum. Helsinki Music Centre 15.10.2017. TV Director Kimmo Kajasto. 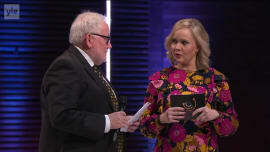 Let the Peoples Sing: Let the Peoples Sing 2017 Final: The Norwegian Girls’ Choir & Anne Karin Sundal-Ask (Norway) Knut Nystedt: Mary’s Song (Luci Shaw). Carl Gustav Sparre Olsen: Å leva (Anders Vassbotn). György Orbán: Lauda Sion. Helsinki Music Centre 15.10.2017. TV Director Kimmo Kajasto. Let the Peoples Sing: Let the Peoples Sing 2017 Final: Vaskivuori Upper Secondary School Chamber Choir & Jonna Vehmanen (Finland) Trad. arr. Sanna Salminen: Anda Niilas tunturissa. Trad. arr. Jonna Vehmanen: Läksin minä kesäyönä (Elias Lönnrot). Nils-Eric Fougstedt: Tiga blott (Nils Ferlin). Trad. arr. Let the Peoples Sing: Let the Peoples Sing 2017 Final: Prize Giving Ceremony of Open & Adult Categories The first prize of Open Category: Slavonic Tractor (Finland). The first prize of Adult Catgory: Collegium Musicale & Endrik Üksvärav (Estonia). Helsinki Music Centre 15.10.2017. Let the Peoples Sing: Let the Peoples Sing 2017 Final: Slavonic Tractor (Finland) Lauri Mäntysaari: Himot. Trad. arr. Värttinä - Slavonic Tractor - Anna-Maija Ihander: Kylä vuotti uutta kuuta. Krassimir Kyurkchiyuski: Pilentse pee. Helsinki Music Centre 15.10.2017. Let the Peoples Sing: Let the Peoples Sing 2017 Final: Collegium Musicale & Endrik Üksvärav (Estonia) Veljo Tormis: Pulmaliste saabumine (Vadja pulmalaulud). Arvo Pärt: Bogoroditse Djevo. Erkki-Sven Tüür: Gloria (Missa Brevis). Cyrillus Kreek: Taaveti laul nr 1 Önnis on inimene. Let the Peoples Sing: Let the Peoples Sing 2017 Final: Copenhagen Young Voices & Poul Emborg (Denmark) Claude Debussy: Dieu, qu’il la fait bon regarder! (Trois chansons de Charles d’Orleans). Johannes Brahms: Letztes Glück (Fünf Gesänge op. 104/3). 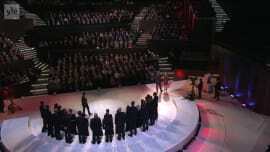 Let the Peoples Sing: Let the Peoples Sing 2017 Final: Voices of Hope & Simon Fidler (UK) Trad. arr. Percy Lowell: When the Boat Comes In. Nikolai Golovanov: Otche Nash, op. 9/3. Bricusse & Anthony Newley arr. Jim Clements: Feeling Good. Helsinki Music Centre 15.10.2017. 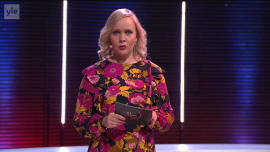 Yle isännöi EBU:n Let the Peoples Sing -kuorokilpailun Musiikkitalossa 14.-15.10.2017. Korkeatasoisessa finaalissa kahdeksan kuoroa Norjasta, Suomesta, Tanskasta, Virosta, Englannista ja Jerseyn saarelta tavoittelee Silver Bowl -pokaalia. Katso suorana Let the Peoples Sing -gaala la 14.10. klo 19 Areenassa ja finaali sunnuntaina 15.10. klo 20 Yle Teema & Fem-kanavalla tai Areenassa . Gaalan juontaa Riikka Holopainen ja finaaliin kaveriksi tulee Riku Riihilahti. Finaalin selostaa suomeksi Ahti Paunu ja ruotsiksi Bertil Blom. Mikäli haluat kuulla ruotsinkielisen selostuksen, valitse äänitiedoista ääni 2. Jos haluat katsoa lähetystä ilman selostusta, valitse äänitieto 3. Myös Areenassa voit katsoa lähetystä selostuksella tai ilman. Ohjelmat ovat katsottavissa maailmanlaajuisesti. Tervetuloa mukaan kuorotapahtumaan!